Tax policy to correct inequality assumes that nobody is entitled to advantages due to luck alone. But the public largely rejects complete equalisation of 'brute luck' inequality. This column argues that there is near universal public support for an alternative, benefit-based theory of taxation. Treating optimal tax policy as an empirical matter may help us to close the gap between theory and reality. Around the world, scholars, analysts, and policymakers are scrambling to design a policy response to concerns about economic inequality. This needs a broadly accepted, flexible framework for policy analysis that sets priorities and incorporates key tradeoffs. Tax policy has such a framework. For nearly half a century, optimal tax theorists have built on the work of James Mirrlees (1971) to construct a powerful apparatus for incorporating – and generating policy recommendations that respond to – many facets of the tax policy problem, including potential sources of inequality. But recent research has found that a core element of this framework – the goal it assumes for tax policy – is at odds with the public’s views, and with established policy precedents. This research suggests that economists seeking to identify acceptable tax policy that responds to high and rising inequality must fundamentally rethink this aspect of their approach. Fortunately, it also suggests a way for them to do just that. In the theoretical literature, tax policy is evaluated solely by where we end up, but recent work has shown that people also care about how we get there. This difference has dramatic implications for our policy response to inequality. The standard model of optimal taxation follows the arguments put forth by John Harsanyi (1953, 1955) that tax policy ought to maximise the sum (or a more complicated function) of individual utility levels, which in turn depend on individuals’ after-tax outcomes. For this, the relationship between how much tax a person pays and his or her pre-tax income is irrelevant to the design of tax policy. All that matters is the after-tax distribution of resources. In this case, the optimal tax policy aggressively offsets inequality. Only the need to retain incentives to work and the desire to reward extra effort justify allowing inequality to persist. Recent research by economists, political scientists, and philosophers has shown, however, that this standard model poorly reflects how most people judge policy. People seem to grant individuals some claim to their pre-tax incomes. My research (Weinzierl 2014) had previously found a popular affinity for John Stuart Mill’s (1871) principle of equal sacrifice, which holds that taxes ought to be assessed in accordance with pre-tax incomes. This affinity explains robust features of existing policy. Other economists have also found related evidence. Saez and Stancheva (2015) ran a survey on distributive preferences and concluded: "[E]vidence showing that both disposable income and taxes paid matter and hence that subjects are neither pure utilitarians (for whom only disposable income matters) nor pure libertarians (for whom only taxes paid matter)." Charité et al. (2015) interpreted their survey results as implying that: "[I]ndividuals, placed in the position of a social planner, do in fact respect the reference points of others." Lockwood and Weinzierl (2016) used the standard model to quantify the implicit priority that policy has given to pre-tax resources. Scheve and Stasavage (2016), political scientists, presented extensive evidence that the equal sacrifice principle has played a prominent role in tax policy across a range of developed countries over the last century. All of these findings supported the observation of the US public’s ‘everyday libertarianism’ made by Murphy and Nagel (2002), both philosophers. This judgement puts moral weight on pre-tax incomes. If people are entitled, even in part, to their pre-tax incomes, the optimal tax policy would no longer offset inequality as aggressively. Taxes would, instead, be focused on raising funds for government activities in a way that tries to respect those entitlements. What explains the gap between scholarly and popular views of the moral status of pre-tax income? A clue might be our attitude to luck. The view that individuals have no moral claim to their pre-tax incomes relies on the ethical assumption that nobody is entitled to advantages due to factors outside his or her control. Philosophers such as Cohen (2011) call this 'brute luck'. Given the importance of brute luck (for example, natural ability, childhood home environment, and early schooling) to a person’s economic status, this assumption directly leads to a rejection of moral claims to pre-tax income. If most people believe instead that individuals have some right to their pre-tax incomes, does that imply that most people reject this reasoning about brute luck? In short, yes. In a new paper, I elicit popular attitudes toward luck by having several hundred US survey respondents consider the situation in Figure 1 (Weinzierl 2016b). The standard model of optimal tax policy gives a clear recommendation in this hypothetical situation of full equalisation of outcomes. 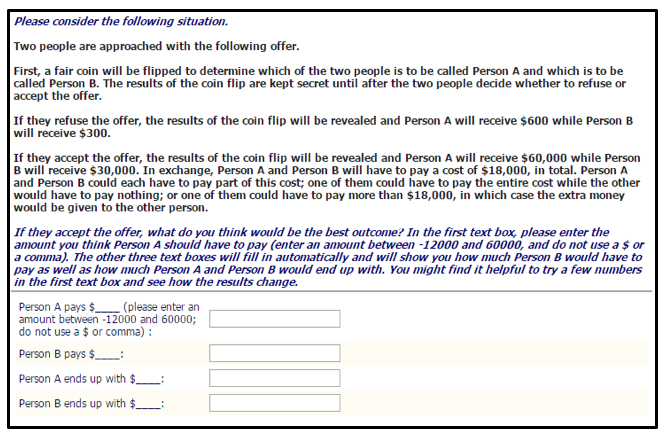 Person A should pay $24,000 because the brute luck of the coin flip provides no reason to allow the lucky person to keep the larger sum. Figure 2. 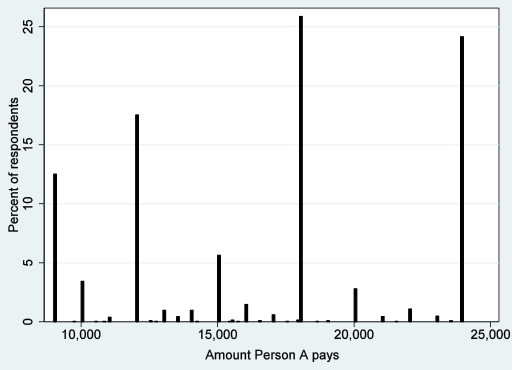 How much should Person A pay? More than 75% of respondents would not fully equalise outcomes in this scenario. Varying the details of the setup changes this share from 50% to 95%. A large share, and in some cases most, respondents reject equalisation of inequality that has arisen from brute luck. This result holds across a wide range of demographic groups and political views. It offers a straightforward explanation for why society grants individuals some moral claim to their pre-tax incomes. The 2016 US presidential campaign’s attention to inequality fits these findings. Some candidates complain of a 'rigged system' and rich individuals and corporations who do not pay their 'fair' share. Critically, gains due to a rigged system or tax avoidance are due to unjust actions, not brute luck. They are due to the toss of a loaded coin, not a fair one. If most people don’t subscribe to the standard model’s view of pre-tax incomes and brute luck, how do they evaluate tax policy? One answer takes us back to tax scholarship long before modern optimal tax theory was developed. In an earlier paper, I revisited a principle called classical benefit-based taxation (CBBT) Weinzierl (2016a). CBBT is the label Musgrave (1959) gave to Adam Smith’s first maxim of taxation, and it has a long history in political rhetoric on taxation, including by Barack Obama. Under CBBT, taxes are assigned according to the benefits an individual obtains, through increased economic opportunities, from the government’s activities. For our current purposes, CBBT has two important features. First, it ignores after-tax outcomes, defining optimality in terms of the relationship between pre-tax incomes and taxes. Second, under CBBT, luckier individuals would pay more tax but would be allowed to keep some of their luck. CBBT may be a principle that explains the findings described above. I pursued the possible role of CBBT by asking survey respondents to choose an explanation for their choices in the hypothetical situation in Figure 1. The first option captures the logic for redistribution in the conventional approach. The second option captures the logic of CBBT. In response to this question, 71% of respondents preferred the CBBT logic, constant across demographic and political groups. More than 90% express some support for CBBT in additional questions. It appears that support for CBBT is nearly universal. Respondents who are more likely to resist the equalisation of luck-based inequality are more likely to support CBBT. These results suggest that many, and perhaps most, Americans judge tax policy in a fundamentally different way to the assumptions of standard theory. These are early steps in developing a new approach to tax theory that I have called 'positive optimal taxation'. This approach modifies the standard optimal tax analysis by treating the objective for taxation as an empirical matter. It uses a variety of sources – including opinion surveys, political rhetoric, and analysis of robust policy features – to highlight gaps between the standard theory and prevailing reality of tax policy. It also identifies and incorporates into the theory alternative goals – and the philosophical principles behind them – that better describe the public’s views on policy. The hope is that this complementary approach will help us to close the gaps between the theory and reality of tax policy, and so generate popular and powerful policy responses to economic inequality. Charité, J., R. Fisman, and I. Kuziemko (2015), "Reference Points and Redistributive Preferences: Experimental Evidence," NBER Working Paper 21009. Cohen, G. A. (2011), On the Currency of Egalitarian Justice, and Other Essays in Political Philosophy, Princeton University Press. Harsanyi, J. C. (1953), "Cardinal Utility in Welfare Economics and in the Theory of Risk-Taking," Journal of Political Economy 61(5): 434-435. Harsanyi, J. C. (1955), "Cardinal Welfare, Individualistic Ethics, and Interpersonal Comparisons of Utility," Journal of Political Economy 63(4): 309-321. Lockwood, B B. and M. Weinzierl (2016), "Positive and normative judgments implicit in US tax policy, and the costs of unequal growth and recessions." Journal of Monetary Economics 77: 30-47. Mankiw, N. G., and M. Weinzierl (2010), "The optimal taxation of height: A case study of utilitarian income redistribution," American Economic Journal: Economic Policy 2(1): 155-176. Mill, J. S. (1871), Principles of Political Economy, Oxford University Press. Mirrlees, J. A. (1971), "An Exploration in the Theory of Optimal Income Taxation," Review of Economic Studies 38: 175-208. Murphy, L. and T. Nagel (2002), The Myth of Ownership, Oxford University Press. Musgrave, R. A. (1959), The Theory of Public Finance, McGraw-Hill. Saez, E., and S. Stantcheva (2016), "Generalized social marginal welfare weights for optimal tax theory." The American Economic Review 106(1): 24-45. Scheve, K. and D. Stasavage (2016), Taxing the Rich: A History of Fiscal Fairness in the United States and Europe, Princeton University Press. Smith, A. (1776), An Inquiry into the Nature and Causes of the Wealth of Nations. Weinzierl, M. (2014), "The Promise of Positive Optimal Taxation: Normative Diversity and a role for Equal Sacrifice," Journal of Public Economics, 118. Weinzierl, M. (2016a), "Revisiting the Classical View of Benefit Based Taxation," Economic Journal, forthcoming. Weinzierl, M. (2016b), "Popular Acceptance of Inequality due to Brute Luck and Support for Classical Benefit-Based Taxation," NBER Working Paper 22462.